I’m sure it did... after the game is played lol. Every one is a big time gambler come the 4th quarter. You might be right, but it's kinda hard to gauge now with United's defense getting light years better right after playing Nederland and held Memorial like 40 points below their average. Crosby, has the ability to make adjustment in the second half of games no matter what the opposing teams score is. That is an impressive trait to have. 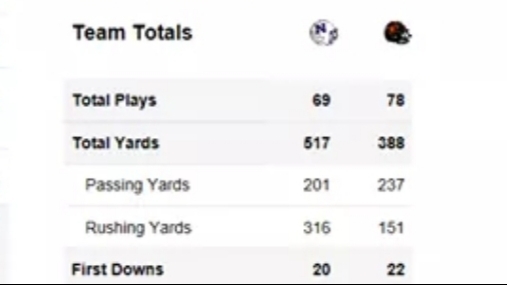 I'm not sure Newton could stop their offense one they get it going. Then you should easily win the pick ems here every week. The score predictor does change,at least it did for the Vidor/ Crosby game. Beat me to it lol. I was about to say that. The answer is no. Next year they'll start 1-3 though. Calpreps computer confirmed what I thought. Only WB would beat Newton. Note Crosby barely got out of Vidor with a W. There are several teams in the greater Houston area that would beat Newton too. 6A's Katy, North Shore, Cy Fair, and Kline Collins, would beat Newton. The rest, no. Thread is so silly. Newton would not beat any of our areas upper level teams. Put them on the schedule next pre-season if you want to know that answer. You won't like it though, and it definitely wouldn't look good on your whole 2A Division whatever class. 2-2 PN-G would not even come close to Newton. Then you are saying Nederland will lose to PN-G, PAM, and Vidor. =Wrong. BTW, Newton is 3A-II, not 2A. Educate yourself. Actually, this post is pretty silly. 2015 wos beat PNG 28-14, 2016 they beat Nederland 42-0. So little ole wos beat two of those teams in your list fairly easily, one they dominated. To sit here and say that Newton wouldn’t stand a chance against those teams you listed just because of what classification they are in is crazy!! Newton got lucky in the Kirbyville game. Refs screwed us. Lol..
Let's see who shows up at AT&T.. out of this bunch. Let's see who has the easiest route to AT&T. Strength of schedule for Newton is weak as hell! Newton would fade down the stretch against just about any decent 5A team. Going up against bigger lines, with more fresh bodies and kids that don’t play both ways would wear the Eagles down. It would make for a good half or so, though. I’ll concede that at this point there’s nobody in this area in 4A that could have beaten them... and possibly only a few in the state. I saw Newton play in Arlington last year and saw everything they had returning this year. I knew then that this year they would beat anyone in this area and I still believe that to be true today. I would like to thank WOS,Silsbee,Gilmer, and especially KIRBYVILLE , they all stepped up to play Newton this year, so guess we’ll never know about the rest!! Honestly, you guys are living in a lala if you think Newton doesn't have a chance against the big schools in SETX. If I remember correctly they have a winning record over most of the now 5a schools and have played close games with the ones that they don't. PNG - Riding the hype of your qb maybe you should consider picking up the rest of your team from PA.
Vidor - is this a joke? One of the highest paid head coaches without a winning record. Nederland - Plays WOS each year because it's the closest thing to a state championship you will get. WB, Memorial, and BU - So much talent, horrible coaching. WB and Memorial can beat Newton due to mass amount of talent.